December 20, 2017 By This post may contain affiliate links. 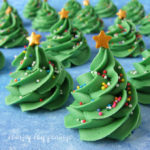 If you can pipe a swirl out of frosting then you can make these three ingredient Creme de Menthe Fudge Christmas Trees. Each sweet little candy tree is decorated with colorful sprinkles and a gold candy star. With the holiday just around the corner I know you are probably looking for some simple treats that you can make for your family and friends. 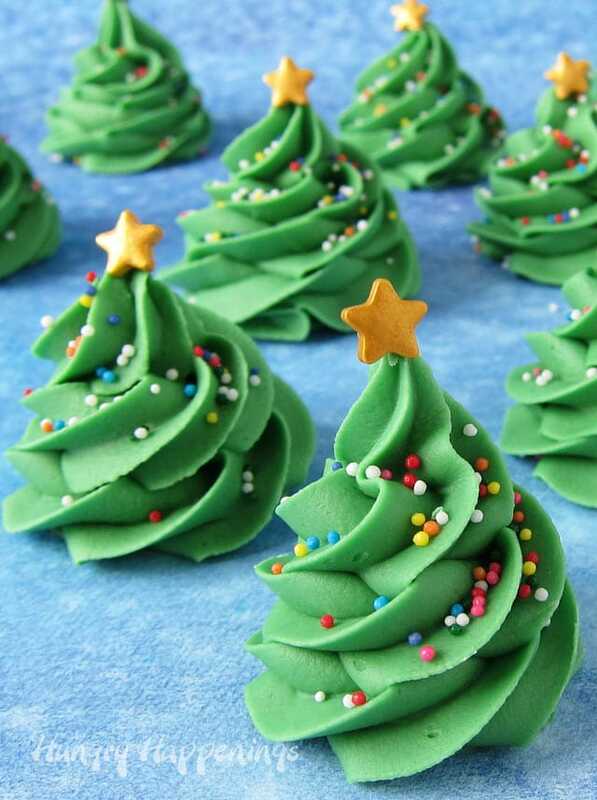 These cute little Creme de Menthe Fudge Christmas Trees only require three ingredients and will come together so easily. These little candy trees will add a really festive touch to your candy or cookie platters this Christmas. Just be sure that you nestle them next to other mint flavored treats like Snowflake Filled Snowman Cookies or Candy Cane Spritz Cookies or Candy Cane Rudolph Treats. Each of thees Fudge Christmas Trees has been sprinkled with rainbow nonpareils. The sprinkles add a fun crunch to the homemade fudge and make the trees look like they have twinkling lights all over them. Then each tree is topped with a candy gold star. It’s the perfect final touch to these sweet holiday treats. To flavor the fudge I used Creme de Menthe. It adds a lovely mint flavor without being overwhelming. If you want to be able to make an alcohol-free version, simply use Creme de Menthe syrup instead of the liquor. If you prefer you can even use peppermint extract or leave out the mint flavoring and just make them white chocolate fudge trees. If you have any questions about making easy fudge using sweetened condensed milk be sure to check out this How To Make Easy Fudge FAQ page for tips and tricks. Festive Creme de Menthe Fudge piped into Christmas tree shapes are decorated with colored nonpareils and gold candy stars. Place the Green Candy Melts in a large, microwave safe, mixing bowl. Stir just to coat the candy wafers. Heat in the microwave on high power for 1 minute. Allow the candy to sit in the microwave for 3 minutes. Remove and slowly stir until melted. If needed, heat for additional 15 second burst of 50% power, stirring slowly after each, until melted. Stir in the Creme de Menthe Liquor or Cream de Methe syrup. Cover with plastic wrap, and allow the fudge to cool and thicken, stirring every 5 minutes, until the fudge becomes the consistency of frosting. Spoon the fudge into a pastry bag fitted with a large star tip. Pipe a big swirl of fudge onto a parchment or wax paper lined baking sheet. Pull up while piping to get a nice pointed tip on each fudge swirl Christmas tree. Immediately sprinkle on some colorful nonpareils. Add a gold star sprinkle on top of the Fudge Christmas tree. Repeat creating about 30 Fudge Christmas Trees. If you prefer to make this fudge using peppermint extract, reduce the amount of white chocolate to 18 ounces. *If you can’t find green Candy Melts, you can use white chocolate or white candy melts to make your fudge. Just add some oil based candy coloring to the fudge once it’s melted. You could also make pretty snow covered white trees if your prefer. You need to watch the fudge as it is thickening and stir it every five minutes. As soon as it is as thick as frosting and it will hold it’s shape when piped, you need to get the trees piped. It took my fudge about 25 minutes to thicken. If you use peppermint extract to flavor your Fudge Christmas trees then it won’t take as long for the fudge to thicken because you will use far less liquid. It might even be ready as soon as the fudge is made. If you find the fudge is too thick to pipe once you get it into the pastry bag, close the end of your pastry bag, and massage the fudge to soften it. The warmth of your hands should soften it just enough that you will be able to pipe it out of the pastry bag. Be sure to sprinkle on the nonpareils after you pipe each tree. The exterior of the fudge trees will dry quite quickly and your tiny Christmas lights will just roll right off the trees if you wait to sprinkle them on. 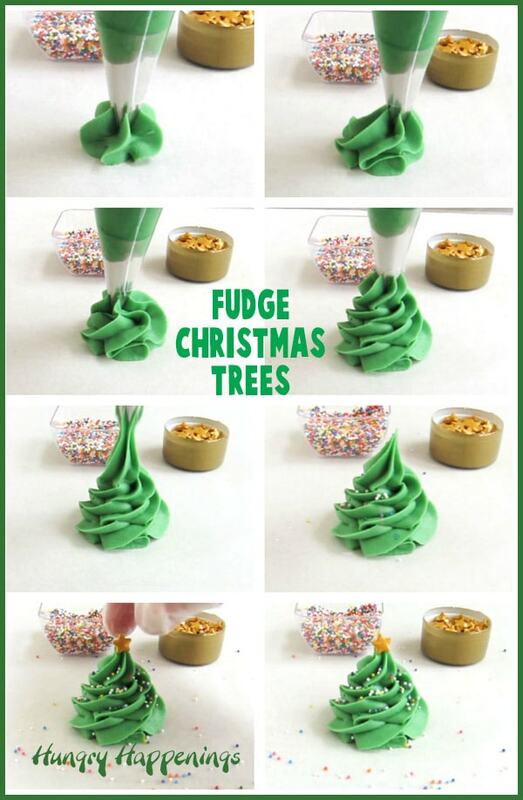 I hope you have fun making a whole forest of Fudge Christmas Trees this holiday season. If you make these treats and share them online be sure to credit Hungry Happenings and link back to this blog post. Use the hashtag #hungryhappenings on social media too. Thanks! If you love to make easy homemade fudge be sure to check out my new site HowToMakeEasyFudge.com. You will find dozens of easy 2-6 ingredient fudge recipe that will make great gifts or desserts for the holidays. Before you go, be sure to check out over 100 other Christmas recipes and food crafts that I have created over the years. 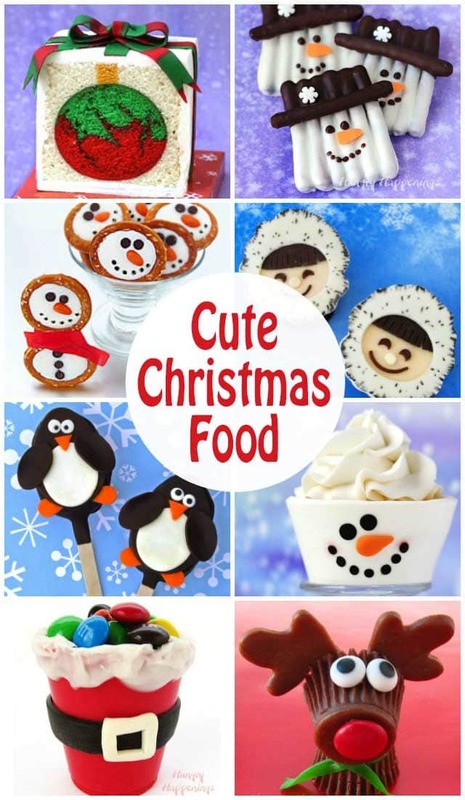 Your family will love these cute holiday desserts and appetizers. Have a Merry Christmas. How much peppermint extract should be used? Stir in 1 teaspoon peppermint extract then taste the fudge. If you like it more minty, add a tiny bit more. Enjoy. Oh Christmas Tree, Oh Christmas Tree – how beautiful and tasty! They were fun to make and they looked so pretty on my platters. Thanks! 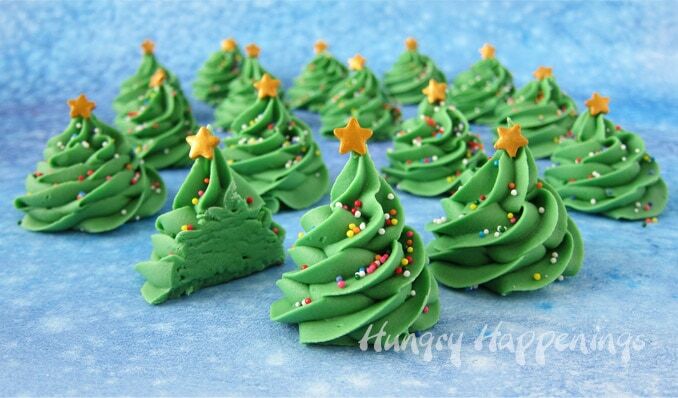 I hope you have fun and enjoy your fudge Christmas trees!